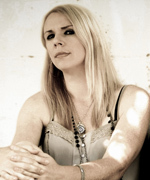 Elizabeth Elkins is a guitar player, songwriter and vocalist known for her work with alternative rockers The Swear and the new alt country band Granville Automatic. A Grand Prize winner of the John Lennon Songwriting Contest, she has showcased at the Billboard/BMI Acoustic Brunch at SXSW, at BMI showcases in Los Angeles, Atlanta and Nashville, and at CMJ. Elkins’ songs have been used on more than 20 television programs from “Smallville” to “Rescue Me”, “Jersey Shore” to CNN and in the film “Mean Girls 2”.